Shane Shirley : It's No-Can-Ber! Are You With Us? It's No-Can-Ber! Are You With Us? As soon as October is over and November begins, all I can think about is pumpkin everything, homemade cranberry sauce, casseroles, and, unfortunately, the array of canned goods advertised in grocery stores everywhere. Canned goods are often seen as a convenient way to put together simple holiday dishes, but often overlooked are the potential toxins that could be lurking in those cans, contaminating the food, and negatively affecting people’s health. 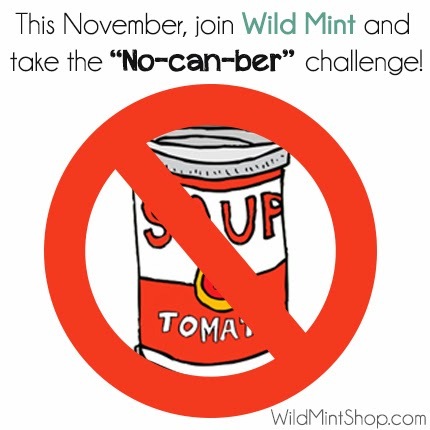 So, for the second year in a row, our team at Wild Mint is hosting a “No-Can-Ber” challenge to help encourage others to make a healthier lifestyle change in the kitchen! The inspiration behind the “No-can-ber” challenge came in 2012 when our family made a New Year’s resolution to avoid canned foods. This goal was not only attainable but would also allow us to experiment with more healthy recipes and avoid exposure to the toxic chemical BPA, found in most canned food lining. After 10 successful months of eating can-free and realizing how easy (and fun!) it is, we wanted to share our experience with others. That November (when many people turn to canned food recipes), we announced our first “No-can-ber” challenge where throughout the month we shared can-free recipes from our own kitchen and the kitchen’s of our loyal fans. Our goal with “No-Can-Ber” is to highlight the health benefits of eliminating canned foods from your diet. While fresh and frozen foods also provide more nutrients than canned and processed ones, we wanted people to know that there is also another, powerful reason to go can-free: bisphenol-A (or BPA). The chemical BPA, which can leach into people’s food or drink and disrupt hormones in the body, is present in the epoxy lining of many metal food cans. And although BPA is found in various other sources in the environment (including in certain types of plastic items and cash register receipts), a new study by the Breast Cancer Fund shows canned food as a major route to human BPA exposure. If you’d like to join our “No-Can-Ber” Challenge, head on over to our Challenge Page and leave comment at the bottom letting us know you’ve joined! 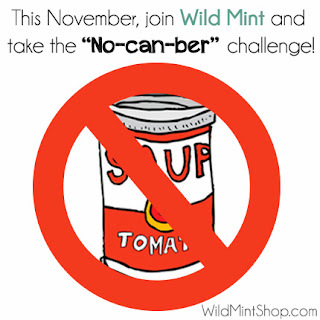 And to follow our “No-Can-Ber” month recipes, check back often on our Recipe and Facebook page, and follow #NoCanBer and @WildMintShop on Twitter. We are also looking for your recipe submissions to help everyone find more great can-free dishes. Just send your recipe to hello@wildmintshop.com or share it on our Facebook page.